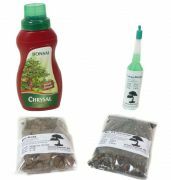 With our bonsai beginner set you are well-equipped for the start of your new hobby. This set is also a great gift idea! Please choose product... Set for beginners Ulme S - 34,99 EUR Set for beginners Elm M - 42,99 EUR Set for beginners Elm L - 53,99 EUR - SOLD OUT !